Every game here on out is a must-win for Seattle and today they turn to the King to keep their playoff hopes alive. Which Felix shows up today? Hopefully, the dominate one. I picked up this lot of 4 team pocket schedules recently. I don’t collect them, per se, but do like the looks of these. They almost look like they could be card designs. It’s not everyday that you get an artist performing concurrently with two of the largest acts in the world of hard rock (or any other musical genre), so when it does happen, what better way to commemorate it than with trading cards stickers. Once I saw these bad boys, I knew I just had to have them. I can’t think of another act (or in this case, two) that is more ripe for a GPK card. With Guns you have Slash and his top hat/hair and with AC/DC, you have Angus and his school boy uniform. And of course there is ‘Fat Axl’ with his handlebar mustache, sitting on Dave Grohl’s throne. Probably no rock star embodies a GPK character quite like Mr. Rose. Hopefully the singer has mellowed out as he’s gotten older. Years ago, Angry Axl would have made the perfect GPK sticker. At $9.99 shipped, I overpaid when I pulled the trigger on these Topps Now stickers- but what the hell. With a print run of only 495 and no guarantee of Axl working with AC/DC (or Slash and Duff) beyond their booked tours, I wasn’t going to let this one pass my by. Larry, a fellow collector and member of a Facebook trading group, sent me a message recently saying he noticed I was looking for some Topps inserts and wondered what I was needing. I decided not to send him my entire list, but rather a list of a few of the inserts from the 2016 set. He replied a short time later, saying he had two cards and offered to send them to me without expecting anything in return. I often struggle with accepting the kindness of others, especially when they are strangers. I usually feel as if I have to return the favor. Granted, the cards Larry sent were not ‘big money cards’- not even close- and they came in a pwe, but I still want to send something in return. He had mentioned he collects things that have to do with Cleveland sports, so I’ll have to go digging for some Indians. Larry, you’ll probably never read this, but I still want to take the opportunity to say ‘Thank You’ for this act of kindness. I recently approached Brad- the Red Sox Fan in Nebraska– about a trade for some cards listed on his trade list. I had quite a few cards from his want list and we quickly struck a deal that both of us were happy with. You can read Brad’s tale of the trade here. I’m still looking to finish off many of the insert sets from 2016 Topps, so I was very happy to acquire these five from Brad. With Update due in the next few weeks, I feel a little more sense of urgency… I don’t want to fall even further behind on my sets. First up, the greatest player of his generation… Mr. Ken Griffey, Jr. Or, just call him the Kid. I like the MLB Debut set but I really wish it was smaller. I’ve been taking any version (Bronze, Silver, Gold) that I can get my hands on, but I prefer the Bronze. They go much better with the borders, IMO. Tip of the cap to ya, Brad. Thanks for the trade! The Model for ’16 Flagship? I’m a Topps flagship collector, so my primary focus during late winter is the Series 1 base set. My primary focus during early summer- series 2 base set. And early fall? 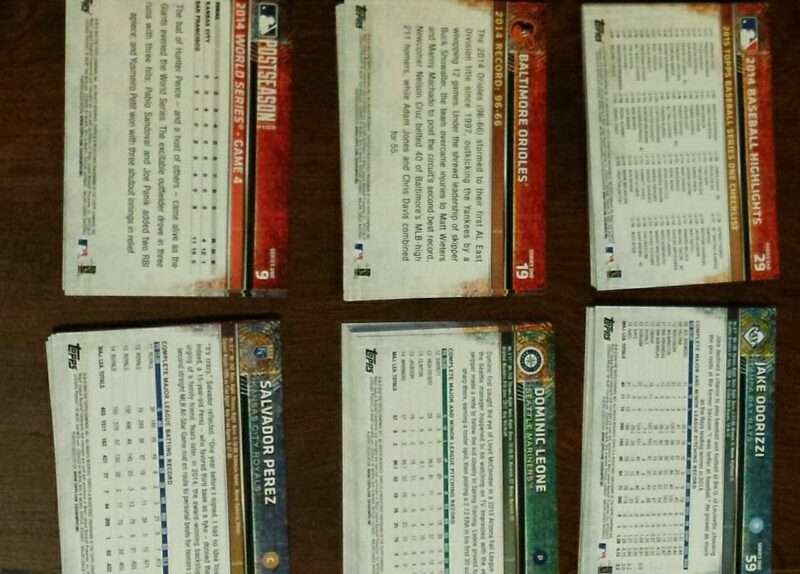 Yep, the Update and Highlights base set. When that’s what you collect, picking up those singles is a no brainer. But what about inserts? Funds prevent me from collecting every insert set in flagship, so I have to be more selective. One insert set from 2015 that I had no intentions of collecting, but eventually added to my collection (well, a few of them, anyway), is the 25-card Baseball Royalty set, found exclusively in hobby and jumbo boxes. I picked up a couple of different lots off of the ‘Bay this summer and noticed they had a familiar look to them. It didn’t take long to see how they seem to have been a model- even if ever-so-slightly- for this year’s set. Add some color to these things and it might be even more conspicuous. I don’t know how far I’ll go in trying to complete this thing. Like I said, they can command a few bucks each. But I figured at the very least I can have a nice sample size for the collection. I have pretty much given up PCing current players. That being said, I do have a few players whose cards I will pick up- should the card be compelling enough. One such player is The King- Felix Hernandez. And since it’s #HappyFelixDay, I thought I’d share my latest card of the King. It also happens to be my first auto of the Mariner’s ace. The ‘Golden Moment’ that this card commemorates took place on May 22, 2011, as Felix became just the fourth pitcher in Mariner history to strike out at least 13 batters without issuing a walk. I contacted Tim over at I Love the Smell of Cardboard in the Morning recently to let him know I had the final Topps Market Side Pizza card (Chris Sale) he needed for his set. I also asked if he had any extras to trade, as I was still missing 8 at that point. Let’s take a look at these glorious pieces of cardboard, shall we? While not a difficult set to put together, Marketside Pizza was just large enough (50 cards) to require some trading, purchases of lots off eBay, and a little bit of patience in order to complete. And I hope to do it all over again with another set next year.